Mykhel Latosa (left) and Jordan MacDonald competing in the Toque d'Or competition. With three days of competition, the New Zealand Culinary Fare represents the most prestigious hospitality competition in this country and one that is believed to be the largest of its sort in the world. Competition is fierce with training providers like AUT footing it with their education counterparts and the industry’s best restaurants and hotels. This year AUT University’s School of Hospitality and Tourism was awarded gold for ‘Training Team of the Year’. The team comprised of two chef students, Kevin Puyat and Teresa Joe as well front of house student Andy Hsu. The team had to cook and serve 6 portions of a three-course lunch. Teams competed from all over New Zealand and of the 12 medals awarded, only one gold was given to the AUT team. Day two of the Culinary Fare hosts New Zealand’s premier tertiary cookery and food service competition – Nestlé Toque d’Or where hospitality students’ skills are put to the test in an intense 150-minute cook off. Each year, students from training institutions across New Zealand battle it out in pursuit of the ‘Golden Hat’ trophy. AUT students Jordan MacDonald, and Mykhel Latosa competed in the Toque d’Or and prepared a four course luncheon for prestigious guests in the arena, served by Elisabeth Young. The team were awarded two silver medals- kitchen and front of house. 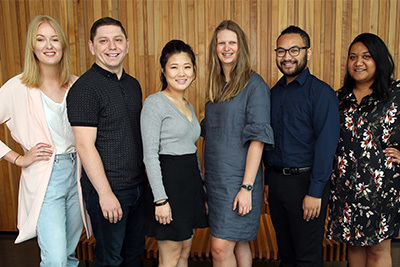 AUT alumni were also recognised at this year’s event with 2009 patisserie graduate Sarah Harrap part of the SKYCITY team awarded ‘Pastry Team of the Year’ and Leo Xia, a 2009 graduate completing his judging qualification. Past graduate Jeremy Schmid’s Two Fifteen restaurant was awarded ‘Restaurant of the Year’. AUT staff also involved with judging at the fare included Arno Sturny, Robert Haddock, Renny Aprea, John Kelly, David Green, Christine McDonald and Suzanne Bliss. 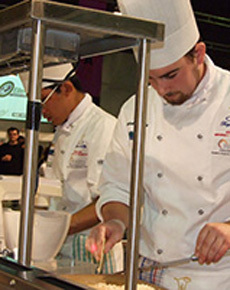 The event, held at the ASB Showgrounds, Auckland, comprises of 60 competitions covering both the kitchen and restaurant sides of the hospitality industry. It provides a platform for hospitality participants to match themselves against their counterparts, to compete for prestigious industryawards and prizes. With up to 1000 competitors, the three days of competition, is believed to be the world's largest annual hot kitchen competition.